What’s New? 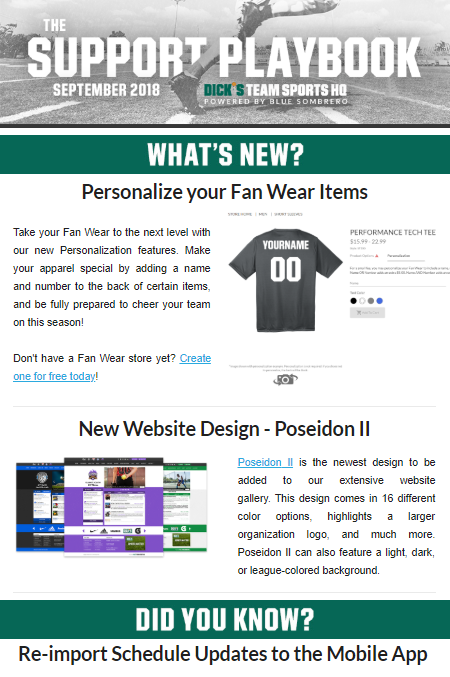 For starters, Fan Wear shopping just got a whole lot cooler with the addition of apparel Personalization! Add a name and number to the back of certain items and cheer on your players this season. Also new this month is another new website design. Poseidon II offers a new layout that will feature your organization’s logo and brand front and center. Check out this new design today. Did You Know? The GameChanger Team Manager app will sync schedules at the beginning of the season, and coaches can re-import schedules to stay current with updates and changes. Teams using the GameChanger Baseball & Softball app can enjoy a live audio stream of games with GameStream Radio! Don’t Forget…Fan Wear is available 24/7, meaning parents and families should stay aware of new items, customization options, and more. Learn how you can keep your store front of mind year round. Aside from raising money through your store, it is equally important to stay on top of money that is owed to your league. When parents forget to make payments or slip through the cracks, there are a few ways to easily identify and remind people to make necessary payments. Social media can be a valuable resource for any youth sports league, and does not require much time to manage. In our Market Your League: 101 section, we review considerations and best practices around how to approach social media for your league.